While connected to the Internet, just like you, I face exposure to Trojans, spyware, viruses, phishing scams, identity theft, scam artists, schemers and cyber crooks lurking in the shadows, just waiting to make me a victim. Even so, the odds of me picking up a malware infection, or being scammed, are low – not 0% but…… Am I just lucky, or is it more than that? An aggressive HIPS (host intrusion prevention system). Despite all those security precautions though, there’s one connected activity that still concerns me – online banking. Regardless of the fact that I choose my Internet banking provider based partially on its low profile (four branches as opposed to the usual 3,000/5,000 branches common in Canadian banking), I’m not entirely relying on this low profile as a guarantee that cybercriminals will not target my provider. Despite my best efforts it’s possible (though unlikely), that malicious code may be installed on my computer – ready to pounce on my banking user account names, and passwords. Which is why, I have long made it a practice to conduct my financial affairs on the Internet via a self-booting Linux Live CD running Firefox. Since a Linux Live CD is read-only media, the environment (running entirely in RAM), will be much more secure than Windows. Yes, I admit that it’s a pain to shut down and reboot just to complete an online financial transaction but, I’d rather be safe than sorry – I’m into an ounce of prevention. Since the majority of malware is Windows specific, banking online through a Linux Live CD is my ounce of prevention. Lightweight Portable Security (LPS) – A Linux distro from the US Department of Defense. Puppy Linux – A complete operating system with suite of GUI apps, only about 70 – 140MB, and boots directly off the CD. KNOPPIX – Live Linux file system on CD. is it possible to run 2 os at the same time? i am using vista. I don’t think you really mean “is it possible to run 2 os at the same time” since the answer is, no. I’ll assume what you really mean is – is it possible to install Linux and Windows to the same Hard Drive and then run one or the other – the answer is yes. Not a dumb question, at all. Finding a public PC where rebooting isn’t a problem is a problem. Most public computers (a library for example), are booted from the network. I often read that a live CD can be booted on a public machine, but I’ve never seen one. My primary home system is a dual boot machine using Win 7 and Ubuntu. On a dual boot system, Linux will have access to the Windows partition – a good thing since it allows me to fiddle with Windows through Linux. But, in a perfect world, it’s better that this not be the case while you do your online banking (possible malware activation). Personally, I stick with a live CD – no access to the HD. . Not that I have bags of money, but what I have I want to keep. 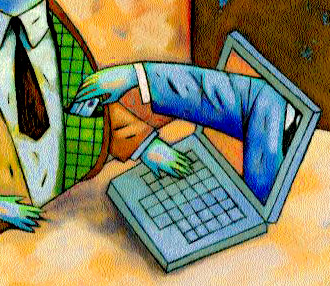 It’s true, that in many countries victims of banking malware attacks have limited liability but, more often now I’m seeing banks take the position that if a customer has been negligent – then, their out of luck. It’s their loss. Expect to see much more of this. Agreed. Binding Win/Linux malware is a logical step for the bad guys. Makes good economic sense to do so. I do all my financials online – banking, paying bills, etc., so for me – a Live Linux CD is the only way to do so safely. Depends really, on what the malware is designed to attack. Malware designed to attack through the Linux Kernel (this was an issue late last year), could be successful in all distros – assuming all are using the same Kernel. Thanks for the tip on BackTrack – I see it has a Forensic mode. Will definitely check this further. It has many benefits including the option to configure Trusteer Rapport to work with any website that you need to sign in to. I tried it but didn’t much like the fact that it seemed to run through my browser at all times even when I didn’t need it. There was no easy way to shut it down. I guess that for people who are not too technically minded it would be a good solution to secure connections to online banking sites! Definitely food for though, as I do online banking too. What I normally do is run all internet activities in virtualization, and financial transactions in normal mode. This way, I know the machine is clean (as far as possible) when I log into my bank. But like you said, any extra protection is useful, so I think I will try out the Linux route. As far as Trusteer is concerned, I tried this out a long way back. I found it took up lots of memory and slowed down my machine. I told them this on their feedback page and uninstalled it. They then asked me, twice, to allow them to remotely connect to my machine as they insisted they could fix this “problem”. I don’t like the idea of ANYONE connecting to my computer to play around with settings, so they lost me right there. Hmm, like your logic – sounds pretty tight to me. Yeah, take the Linux route for a bit and see what you think. As far as Trusteer goes – as I understand it (and this may be old info), it’s live all the time so little wonder it eats up resources. It should only come into play specifically on a banking site. Gotta agree, it would be a frosty Friday before I allowed a remote connect. Waaay outside my comfort zone. It worked ! I bumped into a few problems with drivers & my router, but I got there in the end. Thank you Bill. Yeah, that sounds like a nice round percentage. That always on feature is a turn off for me – one more developer I’m expected to unilaterally trust. No thanks. I do agree that Flashlight is a double edged sword which can be used as an “out”. We’ll’ see much, much more of this, I expect. A log-in page offering to remember details? Now there’s an organization that has a real handle on good security practices lol!! Do you know which is the fastest booting Live CD that can get the job done? Also, would it be necessary to mount the main harddisk to save files into it, e.g. confirmation of transactions performed? As you know, loading from a CD is always slow compared to booting from a HD. Still, I haven’t seen a Live CD that was unreasonably slow. Although, Lightweight Portable Security (LPS) loads slower than most. Not being able to securely save the confirmation messages will indeed be a problem as I need these as proof of payment. Frankly, I was hoping that you would give me the solution. Unfortunately I personally do not have an answer to this. Would it be possible to somehow email the page/file to ourselves? Or perhaps save the page/file into Dropbox and pick it up later when back in the “regular” OS? Having all the answers would be ideal – but, I don’t. As I said earlier, simply posting the confirmation number to the bill works for me, but obviously not for you. While your proposed solutions work within Windows – depending on the Browser (or, Browser add-ons), they will not work on a Linux Live CD. On the other hand – if you were running Ubuntu (on a dual boot basis), for example – capturing a screen shot of the confirmation notice with the built-in screen capture utility, and saving it to the HD is possible. I’m aware of the reasons why my financial institutions doesn’t provide email confirmation of bill payment, but I’m curious as to why yours doesn’t. Will give your suggestion (screen capture) a try when I get the chance. It seems like a poor substitute for the real thing, but…. I’m going to give this a try, but I was wondering, is there a way to keep it updated with security fixes ext. Or is it a matter of downloading and burning the whole package again when a new version appears. Great Weblog, by the way, always informative and helpful – many thanks. Installed Linux systems are updated regularly with security fixes – and, certain Linux rescue disks, depending on functionality, as well. As you’ve ascertained though, the type of Live CDs we’re discussing here, are not. Instead, new releases do require that the downloading/burning process be repeated. Having been an unfortunate victim (although I still don’t know if the PC was involved since I’ve never found any virus) I’ve begun the move to Linux. Big learning curve to handle, but it’s worth the effort – only wish it wasn’t this reason that finally gave me the kick I needed to start trying to swtich. 1) Would installing Linux (Ubuntu 11.04) on a new hard drive be safe enough? Virus scans from Linux of the Windows drive reveal nothing bad. 2) Any danger if I added WINE at some point? There’s a few things that need IE (long story!) but does that create any addition risks? 3) What about virtual machine within Linux? Is that even possible – and if so is that safer? 4) How easy is it to rip my own Live CD of my current up-to-date Ubuntu version? If that’s a 15 minute job then it’s worth the effort. Yes, running from an installed version of Ubuntu (for an aware user), is acceptable. I do this often. Configured properly WINE shouldn’t impact security risks. Running virtually within Linux is easy. – take a look at VirtualBox Safer? Frankly, I’m not sure I see the point. Number 4 is interesting. You can in fact do some magic with the freeware tool ISO Workshop – not sure it’s worth the effort though. “aware user” is a bit frightening! I’m a real newbie when it comes to Linux, although I’ve been experimenting with computers (including coding) for around 25 years. So I’m either a dangerous newbie (too much knowledge is a dangerous thing) or the perfect newbie (I know how to screw things up so I avoid it) – not sure which I am to be honest! 🙂 Windows dulls the senses since it “just works”…expect if it’s simple for my mum to go online via wifi then it’s perhaps too simple (mum would be the target for the up-to-date Live CD). So am I safe enough to use Linux whilst avoiding making glaring security mistakes? Possibly – if you don’t run as root then you’re 90% there? Sorry – an unfair question, but hopefully you follow the point. Re: VM – I’ve heard a fair bit of talk about a VM being the best balance between security and practicality. When it comes to banking security > everything quite frankly, but it was worth mentioning. I think you’re well ahead of the game from a security perspective. Often, it’s not so much what we know that counts; it’s whether we have the wit to ask the right questions that really matters.